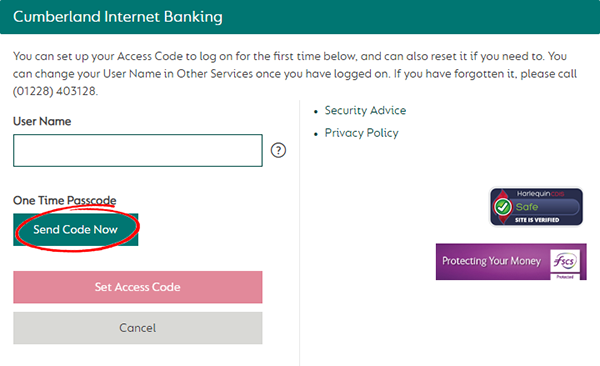 1) Click on the Internet Banking button at the top of the page and Select Set Up or Reset Access Code. Enter your User Name and then select Send Code Now. You can find your original User Name (referred to as your Customer Number) in the welcome email or letter which was sent to you when you opened your current account. 2) You'll receive a One Time Passcode to your mobile phone. Enter this code and select Set Access Code. Then enter an Access Code of your choice and select Continue. 3) Once you've read and accepted the Terms & Conditions, enter a Memorable Word of your choice and select Continue. You're now set up on Internet Banking! 1) Open Internet Banking and enter the User Name and Access Code we provided. Your User Name may have also been sent to you by email. Then, click ‘Log On’. 2) You’ll be asked to create your own Access Code. Once you’ve done this, click ‘Continue’.